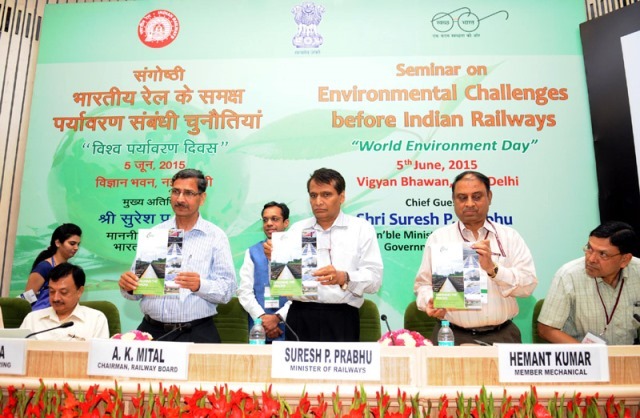 The Union Minister for Railways, Shri Suresh Prabhakar Prabhu releasing a book, at the valedictory session of the Seminar on Environmental Challenges before Indian Railways on the occasion of World Environment Day, in New Delhi on June 05, 2015. The Chairman, Railway Board, Shri A.K. Mital and other dignitaries are also seen. Energy Conservation and Environment Protection has become one of the agenda of the Indian Railways in the last six months. Addressing a Seminar on World Environment, Railway Minister Suresh Prabhu informed everybody that the Railways will not spend a penny more on the energy bill of ₹30,000 crores incurred during the last financial year, despite increasing freight and passenger traffic. He was speaking at the “Environmental challenges before Indian Railways” Seminar. All Zonal Railways have been asked to conduct Energy and Water Audit in efforts to minimize the environmental impact of the Indian Railways. The Indian Railways is the third largest consumer of water after Agriculture and Power sectors and thus needs to give due attention for optimizing and protecting water resources. As part of the afforestation campaign, the Ministry of Railways is working out an Action Plan in collaboration with the Ministry of Environment and Forests (MoEF) to grow indigenous species of plants on Railway lands with an aim to increase the green cover and address environmental problems like soil erosion. This, according to the Railway Minister, will also create additional employment opportunities. Railway Minister also noted that the aim behind all this is to reduce the carbon footprint of the Indian Railways by promoting alternative and renewable energy sources in a big way. He said that the Railways has set a target of generating 1,000 MW of Solar Energy and 200 MW of Wind Energy to substitute part of its own energy needs in the next five years. The Chairman Railway Board Shri A.K Mital further informed that the Indian Railways is also promoting biodiesel fuel and LED lighting at Railway Stations and railway coaches. 17,000 coaches of the Indian Railways have been retro-fitted with biodegradable toilets and that another 17,000 coaches will be added to this list in the coming year. The above mentioned Seminar, which was organised to commemorate the Environment Day, also saw the launching of an eBook entitled, “Indian Railways – Marching Towards Better Environment”. A Report of the Council on Energy, Environment and Water (CEEW) on “Solar Energy Potential of Indian Railways” from Dr. Arunabha Ghosh, CEO, CEEW was also received on the day. Pollution Control Board for Air & Water came into existence w.e.f. 1982 & 1984 respectively. Suppose any Govt. Organization (e.g. Indian Railway) seeking to accredited UP Pollution & Control Board.They are asking consent fee cumulatively since enforcement of law.Which is quiet difficult for organizations to manage huge consultancy charges and plays in totality as a negative catalyst for Eco-friendly, Green & clean mission of government of India projects. In my opinion, some exemptions may be prevailed by organizations in participating environment protection drives. Kindly issue some guidelines on the subjected issue in combating against environment degradation & sustainable development.